Midnapore and Sundance residents are actively engaged in their community and keeping them informed is our top-priority. 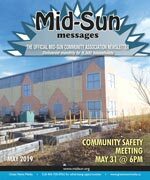 MidSun Messages is the official community newsletter, and covers community news and is published monthly to keep content current and relevant. Delivered to every household, apartment, and business, every resident is acquainted with the community’s most important information. The Mid-Sun Community Association was founded in 1977, and serves the 18,000+ people residing in the communities of Midnapore and Sundance, as well as other residents of south Calgary. The current facility was built in 1987; expansion plans are currently undergoing review. The Mid-Sun CA is a founding member of the South Fish Creek Recreation Complex, and a member of the Trico Family Leisure Centre. Representatives from the Mid-Sun CA sit on the governing boards of both of those organizations. The Mid-Sun Community Association strives to offer accessible recreational programming, and a venue for fostering community spirit. The success of the Community Association is due to the efforts of a great many volunteers, and residents who support the association. In the City of Calgary’s 2012 municipal census, Sundance had a population of 10,499 living in 3,406 dwellings, a -1.2% increase from its 2011 population of 10,623. With a land area of 4 km2 (1.5 sq mi), it had a population density of 2,600/km2 (6,800/sq mi) in 2012.Residents in this community had a median household income of $91,623 in 2000, and there were 5% low income residents living in the neighborhood. As of 2000, 14.6% of the residents were immigrants. A proportion of 3.1% of the buildings were condominiums or apartments, and 6.5% of the housing was used for renting. For more detailed info visit the City of Calgary community profiles site.